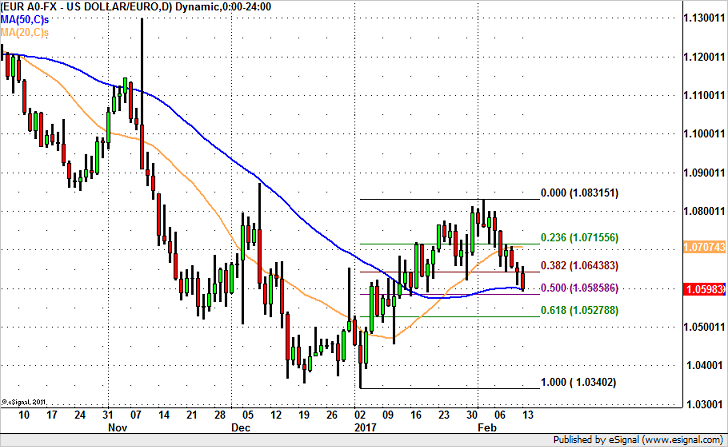 Is EUR/USD Headed for 1.05? The Euro dropped to its lowest level versus the U.S. dollar in more than 3 weeks today. With very little EZ data on the calendar, the slide was driven entirely by U.S. dollar strength. The corresponding rise in the U.S. dollar, U.S. stocks and increase in Treasury yields tell us that as a group, investors are looking for optimism. There haven’t been any dramatic changes in the U.S. economy since December – when we last heard from the Fed Chair. While earnings growth slowed and the unemployment rate ticked up, stocks are trading at record highs as both manufacturing and service sector activity remain steady. Based on comments made by other U.S. policymakers, the Fed is confident about the outlook for the economy and inflation. Just this morning, the Fed said inflation expectations are at their highest level since the summer of 2015. Yellen’s not speaking until Wednesday however so Eurozone data could determine EUR/USD flows over the next 24 hours. A number of important Eurozone economic reports are scheduled for release including Germany and the Eurozone’s fourth quarter GDP numbers along with the German ZEW survey of investor confidence and Eurozone industrial production. Technically while 50-day SMA is currently limiting losses in EUR/USD, we expect further losses in EUR/USD but there’s no doubt that the currency pair needs to clear support at 1.0585 before that can happen. Otherwise it may rebound back up to the 38.2% Fibonacci retracement of this year’s move near 1.0650. If 1.0585 is broken in a meaningful way, we expect a smooth slide to 1.0525.